Let me elaborate a bit more on the Modern Warfare sounds. The simplest sounds to produce are racking sounds, change of weapon shooting sounds, a grenade or a flashbang hitting the ground. We will need two objects – any kind of ASG or EAG rifle, a glass ball and a deodorant. We may generate sounds from a battlefield, by adding sounds of shootings and firearms to the already recorded voice from a short-wave radio. I guess everyone, who played the second part of the Call of Duty Modern Warfare 2 will recognize the introduction to the last mission in this game. Well, the voice of Captain Price, dubbed by Billy Murray, was repeated several times using the Sampler and changing the octave. You can achieve quite a funny effect by speeding up a character’s voice, like in e.g. the Chipmunks cartoon or in the last scene of the Beetlejuice film). In the same way you may transform the sound of a gas burner into the sound of a working plane engine (the pitch of these sounds depends also on the high and medium tone settings in the equalizer). I think everybody remembers a curious shell trick we usually get to know in our childhood. It is cheating on our hearing sense, because in order to achieve the same effect it is enough to cover one’s ear with an open hand. Below I am going to present illusions created by the sound producers from the Wachowski brothers film trilogy or the Matrix film. 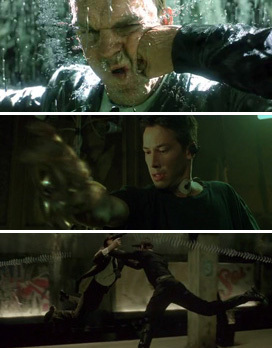 One of the prime sound effects in the Matrix trilogy is the "electric rifle". This effect is a lengthened sound effect of fireworks swish outburst and a sound of a mortar bomb flight. Another example is the sound of "leaving the Matrix". In the famous scene, when Neo leaves the Matrix, Neo’s voice was repeated in the same way as Captain Price’s voice was in the Call of Duty Modern Warfare 2. However, in Neo’s case a large number of repetitions was introduced. The same method was applied do generate the sound of transforming ordinary people into agents, and the sound accompanying Agent Smith’s death. In those times it had to be a great burden for computers, due to the number of sounds heard each second. During the combat scenes we hear mostly reversed wind, hand movements or towel flaps resembling the wind (similarly to the kung-fu films, e.g. the Fist of the Legend). In order to generate the sound of the guards’ tentacles, it is enough to speed up the recorded sound of waving one’s hand inside a leather jacket sleeve, brushing one’s nails against a polyester backpack, or putting on quickly corduroy trousers. Meanwhile, the sound of spreading tentacles can be generated by brushing disposable plastic fasteners against cardboard. The movements of a large group of guards are in fact a slowed down recorded sound of a plastic A4 sheet movement (the sound is similar to the one of a draught). 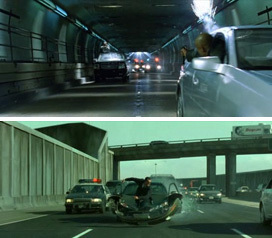 In the Matrix Reloaded film the producers often used the method of slowing down and speeding up the sound, e.g. during the scenes of the chase on a highway. One of the simpler examples of the slowed down sound is a moderated sound made by switching the computer power supplier, used as a sound effect of switching off the ship control centre. The sound of Mechs walking was produced by hitting a stone against the floor (using the reverberation), as well as the sound produced by the gas shock-absorber (the one found in kitchen cupboards). Switching on a three-part saw (e.g. the one used in the "Tomorrow never dies" film) is nothing else but the sound of a wood saw and the bicycle chain movement. (The sound of the bicycle chain movement appears also in the scene of loading Mech’s ammunition). The sound producers in the film industry often use the sound effects from libraries, not adding any sound effects to them, though (well, let’s say that they quieten them down a bit). Here is one example. The sound producers working on Matrix Revolutions did not bother too much about the scene of giant machines attacking Neo’s ship. The Flak Cannon shot sound substituted self-created shots not from this world. Now let me introduce a nice riddle. What does Ironman have to do with fishing equipment? Well, in the scene when the film hero is putting on his armour, we hear most of the time the sound of a fishing reel. As far as the use of funny sounds in films is concerned, e.g. in the Terminator 3 movie a bouncing inflatable toy was used as the basis of sounds of hitting the Timpani instrument. At the end of the film the sounds of the falling helicopter doors and squeezing the T-X with it were based on the sound of hitting an object with a frying pan. I also noticed in that film how you may create the sound of closing an old lift – you should record the sounds produced when folding up an ironing board. Referring once more to the Matrix Reloaded film, what is worth noticing is the famous combat scene between Neo and a hundred of agents. If you listen closely to the falls of Agent Smith, you will hear twice the sound of collapsing bowling pins. I know personally one of the few acoustic illusions introduced by the actors themselves in the Broken Arrow film. In order to mislead the soldiers, a sound of a circular sawing machine was produced via a short-wave radio with the use of a disposable razor. Let us now concentrate on the 80s. I would like to familiarize you with the methods of producing sounds of the characters in the famous Alien and Predator series, which are impossible to forget. Well, the characteristic sound of Predator’s "chirping" is a sped up sound of chirping with a human tongue, and the loud growl of Predator is an incredibly slowed down pig’s roar. In Hollywood some sounds are joined during the postproduction in order to achieve the desired result. The most characteristic "wheeze" of Predator is a sped up roar of a gorilla and a monkey. Doesn’t it sound hilarious? 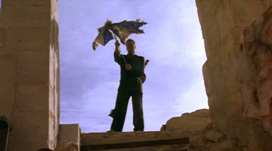 In the photo we can see the Six String Samurai film character closing his umbrella, which makes a "peculiar" sound at the same time. This sound was used in the Fallout 2 game during the reloading of a Gauss rifle and "filling up" the car with thermonuclear cell. 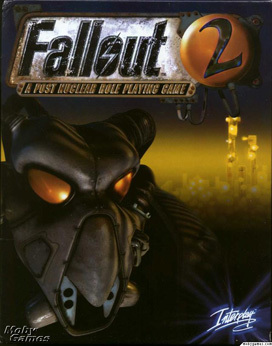 Another curiosity in the Fallout 2 game is a sound not used in the game itself, but hidden in the game files. It is the sound of a talking robot. Another example is the Stalker game, where a snarl of a mutated wolf is a slowed down lion roar. Let’s solve another riddle. What does the Starcraft game have to do with the Broken Arrow film, with the Enslaved game trailer and the opening of the animated series X-Men Evolution? Well, the sound effect heard when clicking at the Academy building, was also used in the Broken Arrow film (the scene of jumping from a train), the Enslaved trailer (the scene of jumping from the top of the mountain) and in the X-Men Evolution (the roar of the Beast). It is not a plagiarism, though! That sound was recorded by means of the Foley Artist and was then added to the sound library, which has been used till today in the game and film production. It reminded me of the famous "Wilhelm Scream", which is the sound used in more than 100 films, not mentioning one movie, where it was used a couple of times. As far as the most famous sound libraries used in games and films are concerned, these include Rick Viers’ Blastwave FX (he wrote a book entitled "The Sound Effects Bible"), Tommy Tallarcio, Lucas Film, Warner Bros, BBC and Columbia Sound Library. Sound libraries are used in many games and films and are a perfect alternative to hiring all kinds of sound engineers and using Foley Artists. In the majority of the films produced in the 90s, the sound libraries of the following companies were used: Lucas Arts, Warner Bros, Hollywood Sound Effects. Considering games, the most popular sound database was Tommy Tallarico Sound Library. Let me now present a few examples of using the same sounds in a few media. 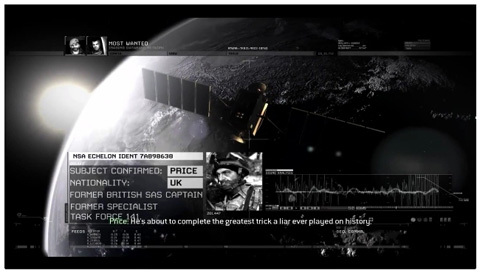 What may be the connection between a war game World in Conflict, a shooter game Call of Duty: Modern Warfare, and the Air Force One film ? The answer is: the radio chatter sound. In the game from the year 1995, entitled Command and Conquer Red Alert, the scream of a dying soldier is the same sound which was used in the Dungeon Keeper game (it is heard especially clearly while torturing the creatures) and in the Gothic series (in the scene of the main character’s death). I discovered the largest number of "mysteries", when I was slowing down and speeding up the sound "live" (i.e. changing the frequency and sampling the sound without the time-consuming processing, e.g. in the Wavelab programme), thanks to the Maya44 card manufactured by the ESI company. I will end this part of the article with one more riddle. What sound makes your blood freeze when you hear it behind your back in a kitchen? The sound of crashing porcelain plates.